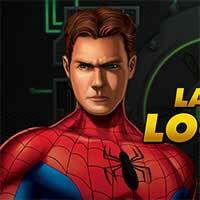 Spider-Man: Laboratory Lockdown Help spiderman stop Doc Ock, Vulture, and Green Goblin in Laboratory Lockdown. The villains have taken over Horizon Labs to pursue a secret experiment that’s sure to destroy the city! Sneak in as Peter Parker and go undetected to find the keys needed to open the high security laboratory, and then transform into Spider-Man to capture the villains. Avoid security guards and scientist in restricted areas so you don’t get caught.Enjoy it on Creetor.